I dropped by S.C.R.A.P. again today, and am sure glad I did! I really lucked out on getting a ton of items–I got 11 items for $5.75! (And one item was $4 itself, so 10 items for $1.75…amazing! 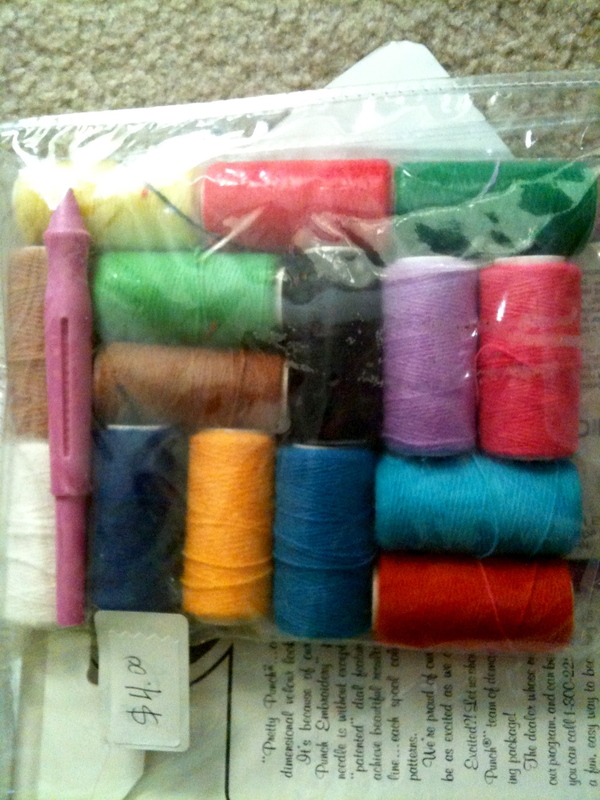 I got 5 tiny embroidery kits for 10 cents each. 2 of them come with their own little frames, and one is another embroidery kit that comes with a tiny hanger to display it on. 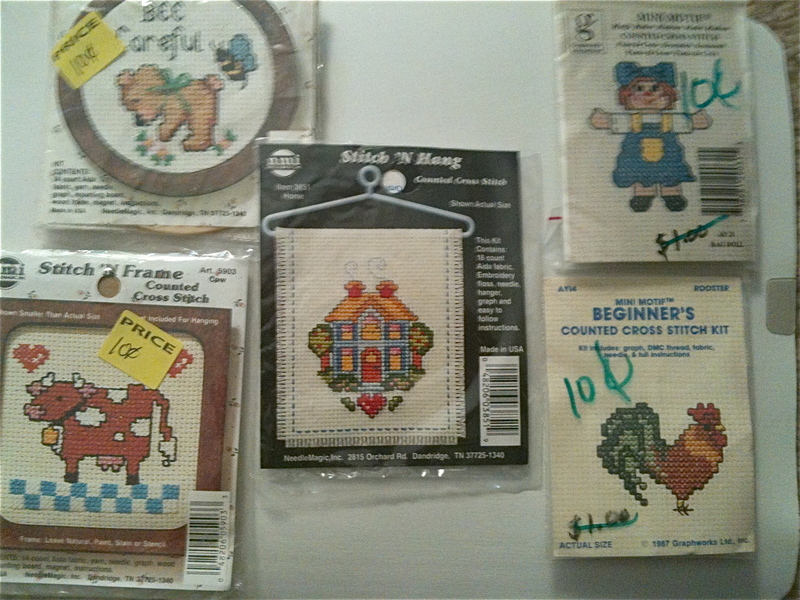 I think the cow and chicken ones will belong in my planned kitchen embroidery display wall, the other ones I’m not sure what to do with yet. But they were just so adorable, and perfect little quick projects to do while I watch a movie with the BF. I picked up a bear 3D ornament kit. 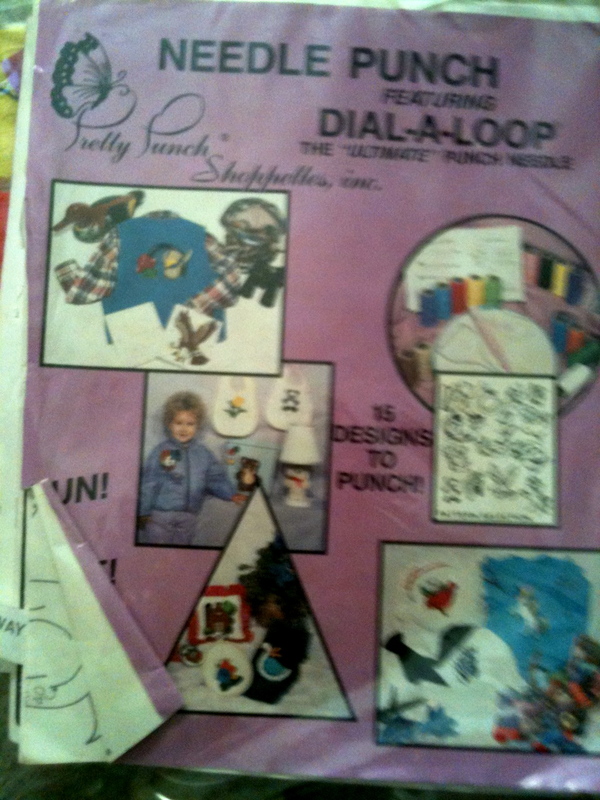 He comes with the batting to stuff him with and gets embroidered with the enclosed yarn instead of thread. I’m accumulating quite the stash of Christmas ornament kits, which I can’t wait to decorate my house with this winter, as it will be our first Christmas together in our own home. 🙂 The kit on the right is a beaded sachet kit. It has flowers and hummingbirds that you embroider with thread, and a blue background that you embroider with little seed beads. It even comes with the potpourri to stuff it with. 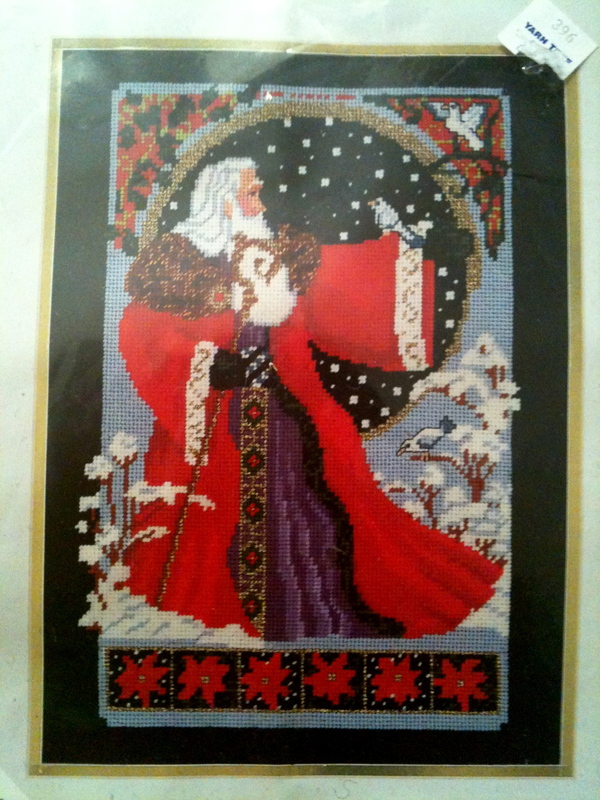 I’m excited to complete that kit because I’ve wanted to learn more about beaded embroidery. 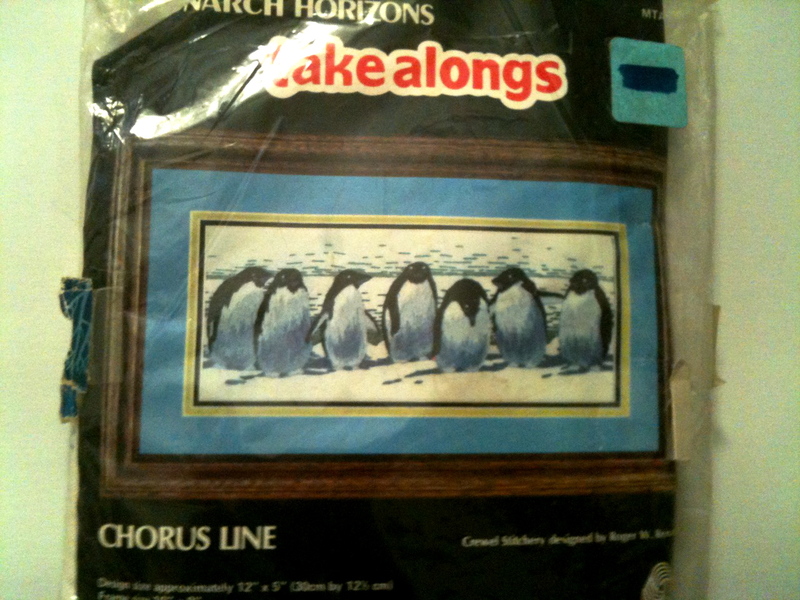 The next kit I got is a little 12″ by 5″ Penguin crewel embroidery kit. I only have done crewel once (with another kit for a pincushion that I picked up at the San Francisco SCRAP) so I’m excited to try this one which looks a bit harder. My sister has always been obsessed with penguins so if I’m happy with the outcome of this project it will probably be sent to her. 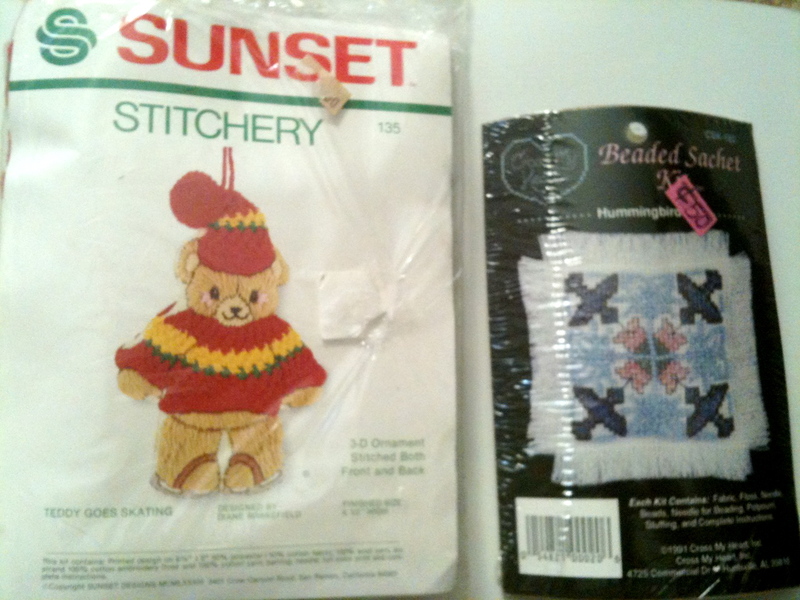 This is a huge needlepoint kit (10″ by 14″) that you embroider with tapestry yarn. Another Christmas one! It comes with a lot of metallic threads which I love. I haven’t done any “needlepoint” which I think is basically embroidery with yarn instead of thread…but this one looks amazing. And it comes with so much for only 50 cents! 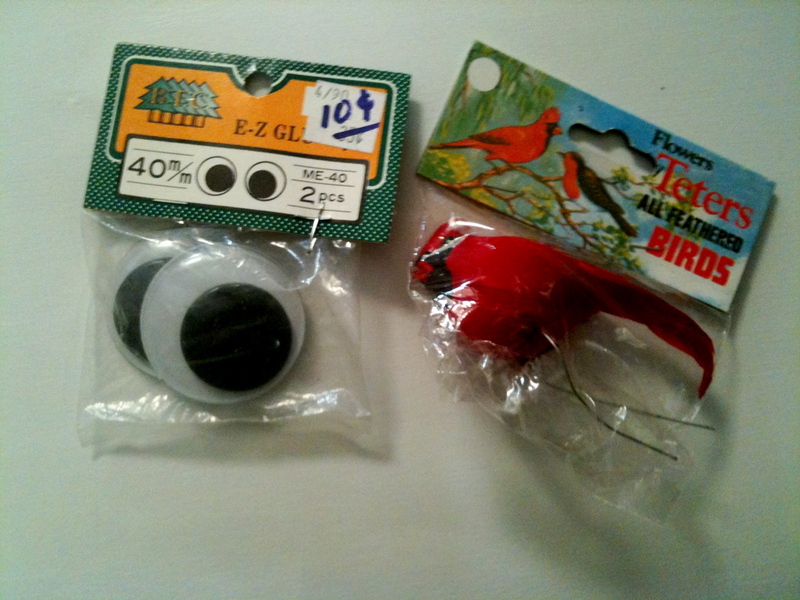 Two small things I got are a pair of the biggest Googly eyes I’ve ever seen, and a pretty little red bird to go with my owls. I’m not sure what people use these little creepy/cute birds for…perhaps floral arrangements? I just think this little red cardinal is adorable. I will either find somewhere for it to perch year-round, or maybe put it on my first Christmas tree this year. Wow, it really MUST be Christmas in July because I sure have the holidays on my mind. 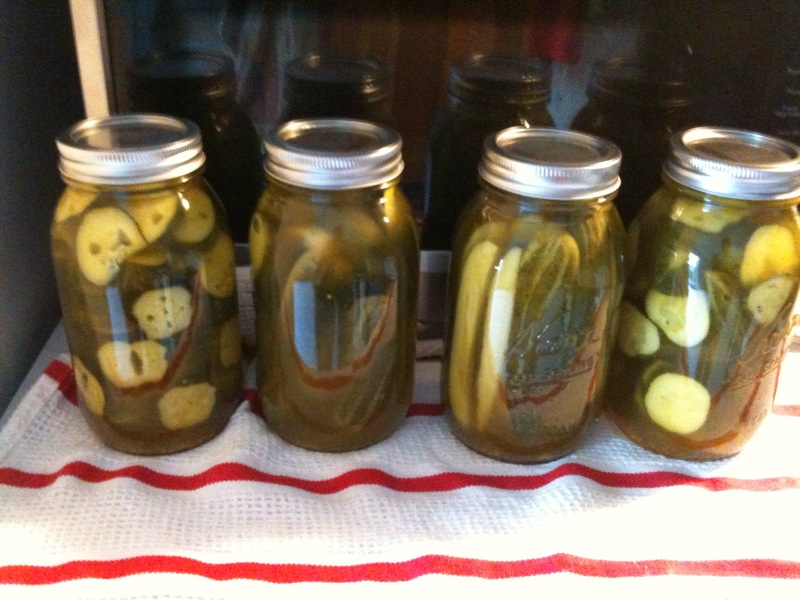 I have wanted to can pickles for a long time, but everything I was reading online was scaring me off from the project. You must buy this and this expensive equipment, keep your jars at exactly the correct temperature before putting your pickles in, etc. However, I ran across a pickling basket at Wal-Mart (in their seasonal section) and decided that was really all I needed. 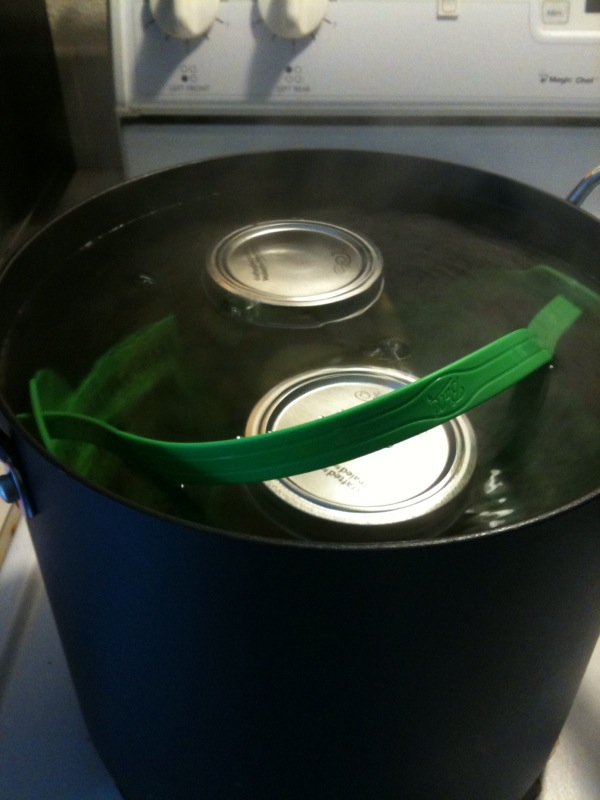 I already had a big soup pot, and the tongs/magnetic lid lifter/air bubble spatula/ etc. that came with the basket were all just extras. 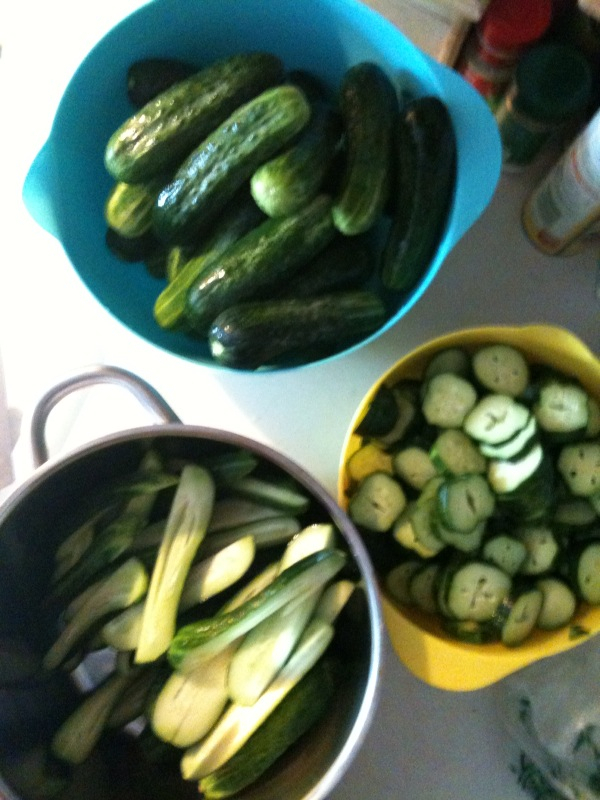 I picked up a flat of quart jars, stopped for some pickling cucumbers on the way home, and decided to just go for it. There are plenty of instructions online (from much more qualified writers) for pickling recipes and how-tos, so I won’t go into that here. I simply used a dill pickle recipe that came with my supplies. It was easy-peasy! The hardest part was committing to the 3 hours or so that it took me to make 7 quarts, since I could only process 2 at a time in my soup pot. Amazingly, all 7 jars sealed correctly! We opened a jar less than a week later when some friends came over for a BBQ. Everyone RAVED about the pickles, and I couldn’t have been more proud. 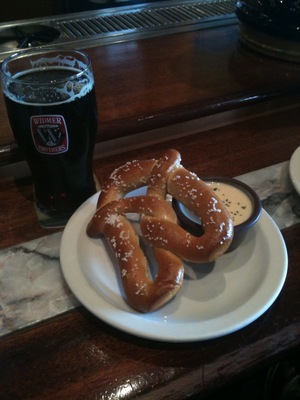 They are absolutely delicious! Then at another BBQ a few weeks later we opened a second jar, and the pickles had only gotten better with age. They were a big hit again. They keep for up to 2 years, though I doubt they will last much longer with the rate we’ve been BBQing! I can’t wait to can many more foods now. Pickled green beans are a favorite, but ones I’ve gotten at the store are so bland. I’d also like to make some simple jams with local berries–come August the blackberries in the Portland area are absolutely everywhere. The BF loves PB&J sammies, but I refuse to buy most jams/jellies because most of them have high fructose corn syrup as their second ingredient! Trader Joes and “Just the Fruit”-type jams are so expensive, so I can’t wait to try my hand at homemade. 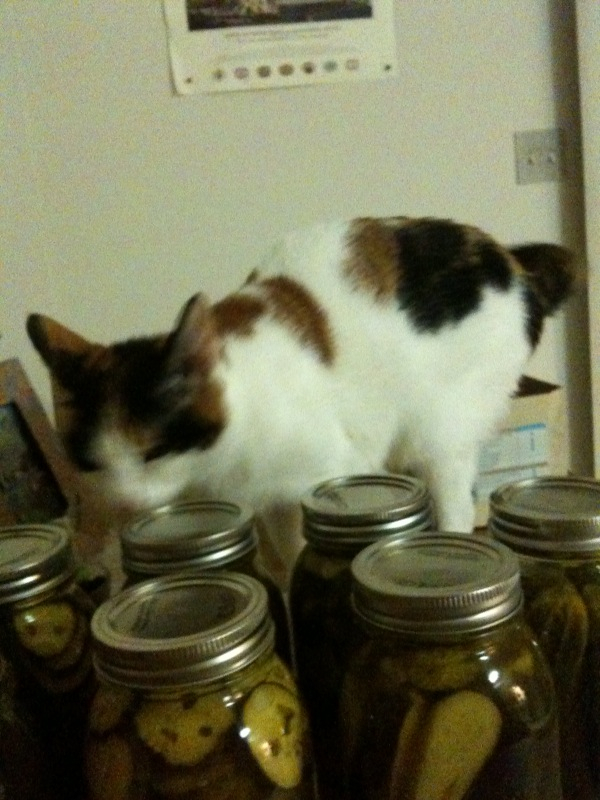 Of course, my loyal feline assistant had to check all the seals on the pickles to make sure we didn’t get botulism. This sweet little guy is one of my favorite belongings. 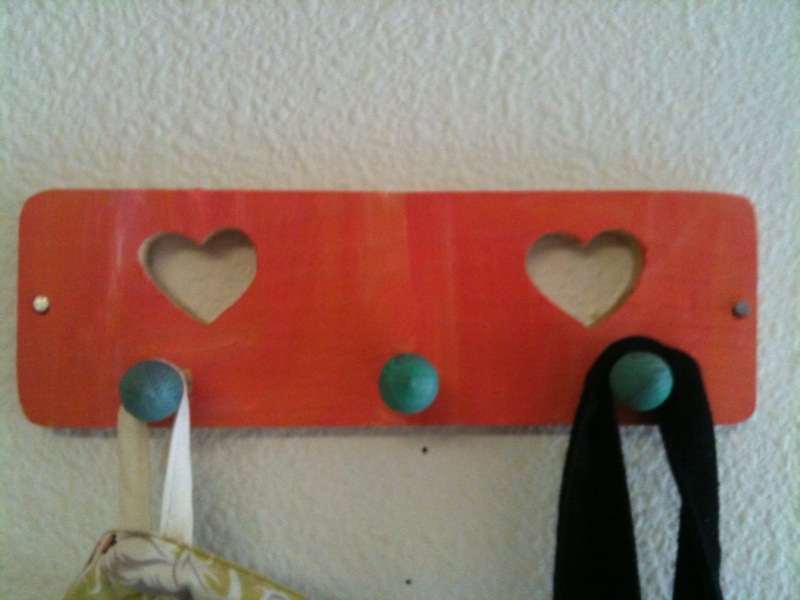 When my 12 year old sister was visiting, we went to SCRAP (my favorite store in the entire world) together, and I found this plain little wooden hanger there in a bin of scrap wood for 25 cents. I asked my sis to paint it for me and I just love the way it came out. I love that the whole project only cost 25 cents since I already had various paints and brushes, and I love how it’s personalized by my sister (and she chose great colors!). Now it holds my aprons in the kitchen. Cheap, personalized, and useful: what’s not to love?! I went mushroom hunting with the BF this past weekend for our first time. A couple months ago we joined the Oregon Mycological Society, and they’re so great. I learn a lot at the monthly meetings and I can’t wait to learn more! 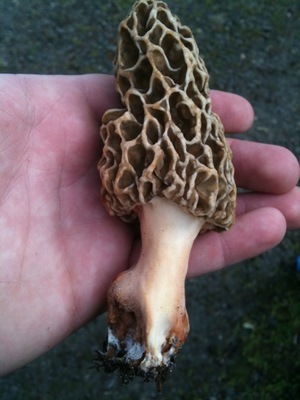 I wrote a post for the Plantwise blog about how to hunt for mushrooms here in Portland. It’s really easy, but don’t expect anyone to tell you exactly where to go! I’m so proud of that huge morel (pictured) that we found, and it was deeelicious later that night (soaked in half-and-half, stuffed with chopped onion, walnuts, whatever cheese you may have, breadcrumbs and spices, then baked for about a half hour). I can’t wait til the next time we both have a morning off and can go mushroom hunting again. After sampling the Prickly Pear Braggot, the BF and I took a short jaunt-just across the street- to check out the happy hour. (Apparently Portlanders love Happy Hours, so at Portland Monthly we’re trying to profile one a week). Though it was held at weird hours (2-5? Who’s even off work then?) and the BF didn’t like the pigs in a blanket (“kinda burnt”), the fondue was to die for. Read my post about it here. On Saturday I covered a charity event for Portland Monthly. It was in support of Bradley Angle, a really cool local charity that supports survivors of domestic abuse. The charity is open to helping anyone though, regardless of your gender affiliation, sexual preference, etc. which I think is just so cool. Plus they are the oldest domestic abuse shelter on the West Coast, and were started by a group of women. The charity event featured famous impersonators: Elvis, Cher and Tina Turner. I didn’t realize that I knew the lyrics to so many of their songs! 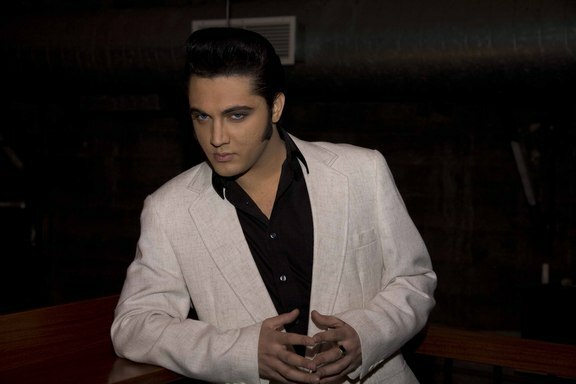 Plus Elvis was a stone-cold fox. He had all the ladies in the audience-young and old-swooning over him. In all it was a lot of fun, a lot more fun than I expected! You can read the short article and check out the photos here. One of the best things about being a journalist is getting to try new things before they’re available to the public, or try things you normally wouldn’t (in this case, because I couldn’t afford to!) 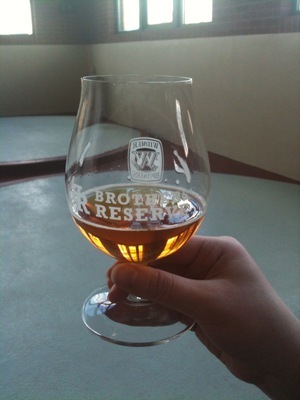 I was lucky enough to cover the release of the new Widmer Brothers Prickly Pear Braggot (half beer, half mead) and wrote about it for Bar Pilot. The best part was getting to take home my own bottle of the fancy $10 beer that I’d never buy in the store normally. Can’t wait to pop it open with the boy for some semi-special occasion!